I met Erin DeCou, Executive Director of Neighborhood Bike Works (NBW), at their headquarters on UPenn’s campus. We took a few loops around nearby Woodland Cemetery, then talked over coffee at Green Line Cafe. Neighborhood Bike Works is a youth-serving non-profit that’s been in operation since the late 90s. 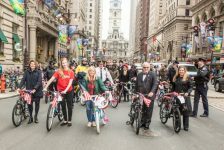 Our mission is to provide educational, recreational, and career-building opportunities to underserved youth, using bikes as the hook to engage them, the means to teach them skills, and get them out exploring Philly neighborhoods and even outside of the city, expanding their horizons. It’s a holistic program where you start out in pretty basic mechanics or cycling classes with us, so they’re either with us for a month or two month, and our goal is to keep them engaged over the long term. This is our mechanics intro class where they get to pick a bike that’s been donated to us. It could be a frame, it could be a bike that’s pretty close to rideable. They get to choose it based on whatever strikes them about it and build it up. They’re learning everything from how to put brake cables on a bike to how to true the wheels, all to get the bike up to riding condition at the end of those two months. They’re learning this tangible skill about bike mechanics. It’s a four-week program where kids come in twice a week after school and they get to ride our fleet bikes. We go on cycling adventures around the city. Right now we have two shops, we’re in North Philly and West Philly. Kids will meet at those shops and go on field trips. In West Philly we may go to Bartram’s Garden or Cobb’s Creek, integrating environmental education. It can make a big impact on kids who don’t necessarily go outside of their neighborhoods all that much. They can go by their own two legs out of the neighborhood and then be exposed to all these really interesting activities around the city. We work with close to 500 kids a year all over the city, mostly in West and North Philly, but also with community partners throughout the city. But also for young kids  and we work with 8-year-olds to 18-year-olds, so a pretty wide range  it can really help with a lot of life skill development, steady goals, and figuring out how to work toward a goal. Even for a lot of adults having a goal of building a bike that you’re going to actually ride in the city is pretty major. Then we’re able to provide a supportive environment with instructors, volunteers, mentors that are going to be able to help them to accomplish that goal. 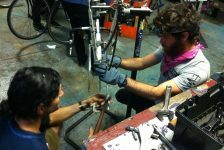 We run a retail bike shop in North Philly and we have our adult repair co-op in West Philly, known as Bike Church. So we’re a resource so that people can come in, use our bike shop, buy bikes, and build it up, just like our kids are. That program is almost entirely run by volunteers, so we have volunteer bike mechanics who are running that shop and facilitating those activities. So you’ll be able to come in and get a little bit of guidance if you’ve never done what it is you’re trying to fix on your bike and get a little help from those volunteers. We have a great need for volunteers. We have volunteer opportunities in our youth programs as well as our adult programs. If you do know a bit about mechanics already and you do like being in a bike shop, then you can volunteer in our adult repair co-op. If you are interested in youth programs, you don’t need to have a lot of bike mechanic knowledge, but it’s good if you’ve worked with kids once or twice and have a sense of how it goes. We can always use help chaperoning rides in addition to assisting with our earn-a-bike program and our weekend classes, as well. It helps with a lot of life skill development, steady goals, and figuring out how to work toward a goal. We rely on a lot of community support. A big part of our budget comes from individuals in our community making donations to support us. In addition, we sell bikes and bike parts. So I’d encourage you if you’re in the market for a bike to check out our North Philly shop. Also, if you have bikes that are sitting around in your basement or garage you can donate them to us and we’ll put them into our youth programs or sell them, which raises money for all of our programs. We have an annual bike tour called the Ride of Dreams, which is a fundraising ride where we go out for four days out somewhere into the countryside, with a bunch of our kids and also adults. Usually about 40 people total go off on one of these 250-mile rides. Last year we went to the Delaware Water Gap, which was a beautiful ride through the New Jersey and Pennsylvania countryside. It raises about $30,000 for Neighborhood Bike Works. We’ll soon be putting material on our website about where we’re going and those dates it’s always in July. We’d love to have new riders join us for that. Definitely something to stay tuned for as we gear up for it for this year. We recently finished up a program called the Winter Bike Build. We had 20-25 kids that build 350 bicycles that are being donated to community centers around the city. In just three and a half weeks, we had kids coming in every day and building up these bikes. It’s sponsored by CH2M Hill, which is an engineering firm in the city, so we were able to pay our young people for building the bikes. So it’s also this job training program for them, and we also get to go around the city with our kids and give the bikes away. So their work is then going out to the world and influencing other young people’s lives.